Once you are crystal clear on what you need (now and looking ahead) and you have your list of possible companies, get in touch with them and tell them your requirements. Ask for an obligation-free estimate. Gather responses, and see what they come back to you with. Don’t be afraid to meet them in person and discuss your needs. Think of it like any other interview – if you were hiring a new assistant or manager, you wouldn’t rely on email or even phone calls, you’d interview the candidates in person. You need to see how you get on, personally, and whether or not you’re compatible enough to form a good business relationship. Get them into your office. While they’re there, assess their attitude and perspectives, bring up a specific issue or two that you’re having, or have had in the past, and see how they react. A tedious but completely necessary step is to look at the fine print that comes with each of the companies you’ve met with. How good is their confidentiality agreement? What are their terms? How long would you need to give notice if you needed to change to a new company? Are there any ‘hidden’ charges that might apply to you? There are a myriad of small details like this that can sway your final decision. Make a pros and cons list for each company based on their estimates, your experience while meeting them, and the benefits and downsides of working with them. It’s time to be decisive! Making the final decision really comes down to a combination of price comparison, the benefits on offer, and gut instinct. When all else is equal, go with your gut! The work doesn’t stop when you choose a company to work with. It’s your responsibility to keep on top of things, take care of all the basics and liaise with your new support company to ensure you are getting exactly what you need. 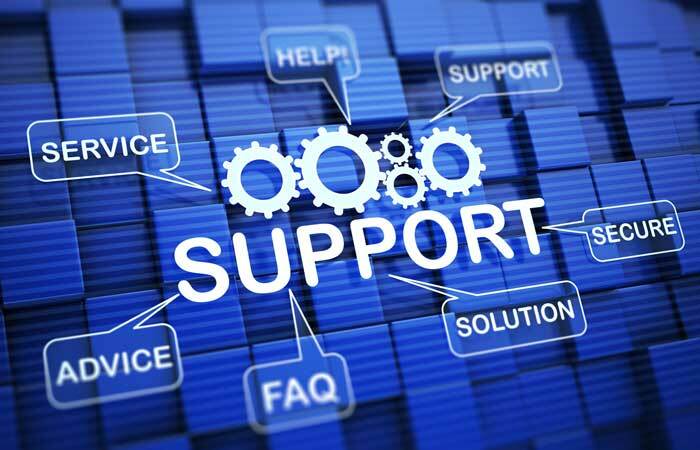 You should appoint a single person to act as the point of contact between your business and your IT support. One person who always deals with them and knows the workings of your relationship backwards. Any problems, on either side, they deal with them – it will make everything run a lot more smoothly! This is a simple but often overlooked process. Start a log of all faults in your system. It ensures you have a record if you need it and will aid your new support company in looking after you as best they possibly can. For many years, a large percentage of businesses have operated day-in and day-out without giving a second thought to their data backup plan. As long as someone in the IT department was periodically performing tape backup then all was considered fine. The challenge today however is that businesses are dealing with unprecedented amounts of data – both from their own internal staff and that of their customers. Planning for the unknown and spending money on something that you aren’t sure is going to happen can be a hard pill to swallow for many companies, but taking care of your business often means formulating strategies for ‘what if’ scenarios. Recent research by the University of Texas has shown that only 6 percent of companies suffering from a catastrophic data loss survive, 43 percent never reopen and 51 percent close within 2 years. So clearly being prepared is your best defense. Still not convinced? Here are five reasons why a disaster recovery (DR) plan should be among your company’s top IT priority. Many businesses today that deal with sensitive client data are required by law to ensure they have an adequate DR plan in place. For legal firms, their client data is the lifeblood of the organization. For healthcare companies, the thought of losing client medical records can not only compromise your business but as well create unwanted legal and public attention. The HIPAA (Health Insurance Portability and Accountability) Act of 1996 was devised primarily to protect the confidentiality and security of client healthcare information. As a result, HIPAA compliance requires businesses to have a DR plan that significantly reduces the risk of patient data loss. In a recent business poll over 50% of businesses currently using a cloud-based DR plan feel that their DR strategy brings them a competitive advantage. Why? In a fast-paced competitive market with greater commoditization of products and services, getting back on your feet faster than your competitor after any natural disaster certainly gives you an advantage. Let’s face it. We have all heard or have experienced the horror of having our PC crash. Now exponentially grow that likelihood and the outcome of that catastrophe is unimaginable. On average, 15,000 hard drives fail every day somewhere around the world. Think about your finance or sales primes losing their hard drive and it’s not hard to understand how impacting that can be on your business performance. You don’t need to look farther then New Jersey to see the effects that a hurricane can have on businesses. Hurricane Sandy made it difficult for many of the businesses located in the 19-county impact zone in New York, New Jersey, and Connecticut to recover. All told, more than 1 million businesses (representing 1,000 different industries) that fell inside that zone experienced significant difficulty in recovering. Add in human error or deliberate sabotage and the negative implications rise exponentially. In airports, train stations, buses, restaurants and other public places, an average of 15,000 laptops go missing every week. Think about the intellectual property that disappears when that data is not backed up. With more competition and a shrinking global market, customers become savvier and less forgiving. Interrupt their service level once and they could disappear forever because your competitor is waiting around the corner to offer them a deal they can’t refuse. Nobody is invincible from a disaster of small or large magnitude, so the key is to ensure that you not only have a plan in place to prepare your business in the event of a disaster, but that you also have a solid plan for recovery when you need it. You can bet that your customers and your business partners would agree.